UPDATE: Download the latest version from the main project page. There is also a console-based version of this utility that’s more suitable for system administrators. 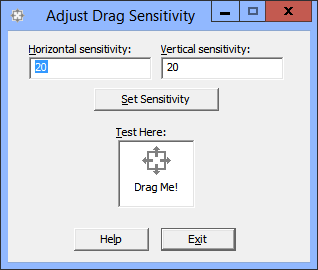 In response to a comment on the previous version of the drag sensitivity utility, I’ve created a new version of the utility that includes a graphical interface and a means of testing the drag settings in the interface. This version also maintains all of the command-line parameters of the previous version so that it may still be used from scripts or batch files. I LOVE dragsens… I work in schools where ever since they started using lots of netbooks/laptops with touchpads folders are dragged and dropped all over the place. This has curbed that except for the occasional know-it-all in the class who just moves things around for ‘fun’… that I can deal with. or something similar that could be parsed in a script) to the command line so that I could script it in part of the login and look for any (new) machines that are not in an acceptable range and then fix them. The alternative is to either use the Windows version on hundreds of them or change them all at each login. Just a thought. Again thank you for what you have done. Thank you, Mark. I’m happy that you’ve found it useful. That’s a good idea you have for returning the existing sensitivity values. I’ll see if I can put that into the command-line version of the tool. It should be a simple change. Hi, will this just affect drag and drop behavior in windows explorer or will it affect dragging and dropping objects in all application? E.g. moving shapes in office programs. It will affect all drag operations in Windows, except for the odd application that might try to bypass the Windows API and do its own drag detection. That should be rare, however. I’ve just double-checked the contents of the ZIP, and it’s clean according to McAfee. Likewise, my weekly site scan has reported no issues. The MD5 still matches, too. Could you tell me who or what flagged it as a Trojan? The Trojan.Gen.SMH designation is a generic, low-risk designation. Since the ZIP contains only an executable, and it’s something of a niche tool, perhaps it’s not well-known enough to have a good reputation. I’ll see what I can do to change that. Thank you for that program! It is in use network wide with “48” in some company LANs now, preventing the accidental “move one folder into another on a network drive” in most cases. Lowers the number of “lost data” phone calls which are just moves files or directories. I know, 48 sounds high, but it is not as high as you may think. Windows 10 Pro 64-Bit. Downloaded WinDragSens.Zip and Extracted WinDragSens.Exe (1.1.0.1 279Kb 1/23/2016) and When Double Clicked Nothing Happens – Also Tried Right Click with Run as Admin. with Same Results? Finally ending the drag copy problem. Great work, made my day! Thanks for the creation!